Roxas woke up in his room in Twilight Town after having another strange dream. Only seven days left in his summer vacation, and he would be spending them with his best friend. But strange things began happening around him. White monsters called “Dusks” attacked; a key–shaped sword called the “Keyblade”materialized in his hand. On the last day of his vacation, Roxas remembered who he really was and what he had been trying to do. 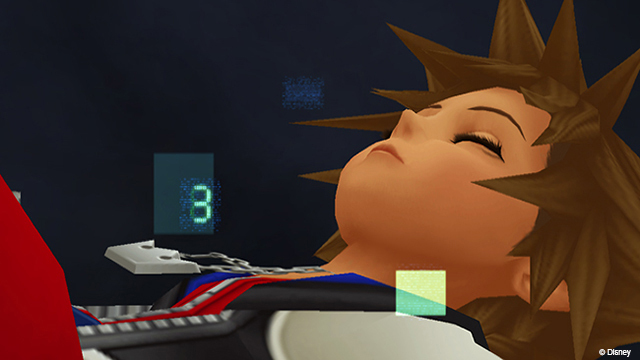 He found Sora sleeping in a pod, and realized his summer vacation would have to end. 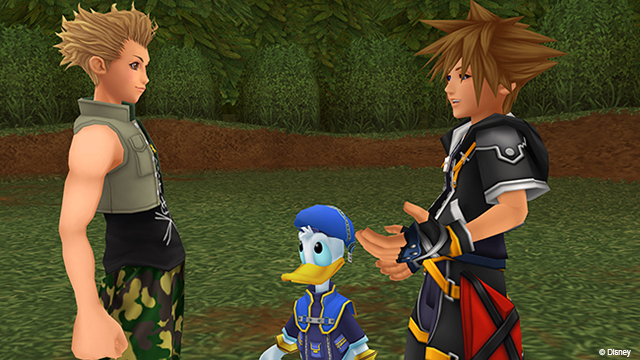 And so it was that Sora, Donald, and Goofy set off on a new adventure. In Hollow Bastion, Sora was reunited with his old friends, and learned that the Heartless were still causing trouble. While dealing with them and the Nobodies, Sora had his first encounter with the Organization since waking. While chasing its member from world to world, he learned that Kairi had been kidnapped by the Organization back in Twilight Town. 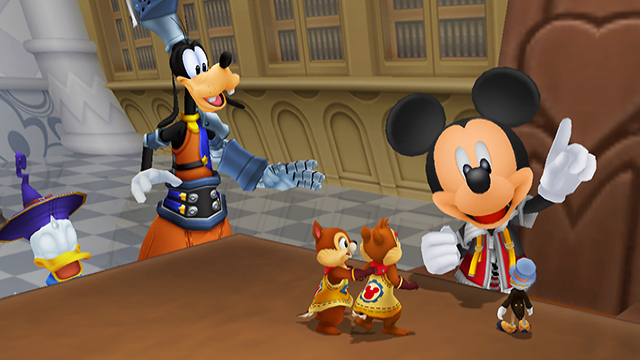 On a second visit to Hollow Bastion, Sora and friends found themselves trapped inside a computer owned by “Ansem the Wise.” They repaired the program and returned to the real world, where they were finally reunited with King Mickey. And boy, did he have a surprise to share! It turned out the “Ansem” Sora fought and defeated was no really Ansem at all. Ansem the Wise had had an apprentice named “Xehanort” who turned into a Heartless. This Heartless stole his master’s name, “Ansem,” while the Nobody that was created in the process, “Xemnas,” became the leader of the Organization. During an epic battle with the Heartless, Sora finally got a glimpse of this new adversary. Sora’s search for Kairi bought him back to Twilight Town. By using the alternate version of the town where Roxas spent his summer vacation, Sora and the others found a way into the realm of darkness. However, along the way, they were ambushed by a horde of Dusks. Axel, one of the Organization’s members, came to the rescue and sacrificed himself to protect Sora – who was, in a way, also his best friend Roxas. At last, Sora had reached Organization XIII’s home world, “The World That Never Was.” He infiltrated the castle, leaving defeated Organization members in his wake, and finally found Kairi. He was also reunited with Riku, who had been transfigured into Anxem as a result of using the darkness within him. Thankfully, Riku’s true form was restored. They met the realm Ansem the Wise, who had assumed the name “DiZ,” and whose blind quest for vengeance against the apprentices who had betrayed him had brought ruin to Roxas and countless others. Realizing the error of his ways, Ansem the Wise blew up the Organization’s Kingdom Hearts as atonement, and was himself engulfed in the blast. Atop the castle, near what remained of Kingdom Hearts, Sora and the others confronted and defeated Xemnas. Naminé opened a gateway home; symbolically, she and Roxas accepted their place with Sora and Kairi, the people they had come from. As Sora and Riku tried to follow Kairi and the others out, the gate suddenly closed. Xemnas had survived, and Sora and Riku were flung into a final battle. They were able to dispatch Xemnas, but there was no escape from the realm of darkness. At the Dark Margin, they stared out to sea, ready to give up… but then a letter in a bottle washed up. It was from Kairi. A door to the light appeared, leading them back to their home, the Destiny Islands, where all their friends were waiting. 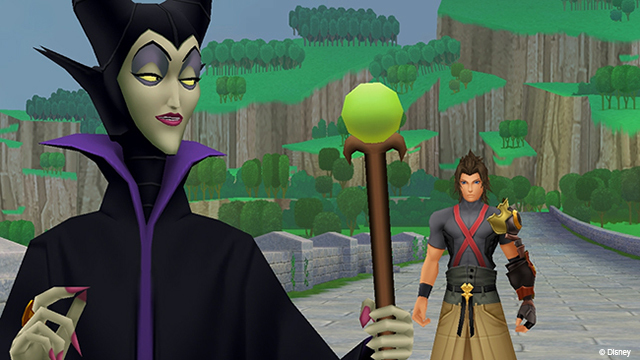 Master Xehanort had decided to abandon his pupil Ventus on the Destiny Islands. The boy’s heart was fractured – useless. But his heart was saved when a “new heart” found Ventus and helped him fill the void. Several years passed, and Ventus forgot what had happened. He had found a new home in the Land of Departure, a sacred ground defended by a long line of Keyblade Masters. There, he met two other youths named Aqua and Terra, and together they trained with Master Eraqus to become Keyblade Masters. Both Terra and Aqua should have been named Keyblade Masters, but Master Xehanort intervened, convincing Eraqus to test his pupils with a “Mark of Mastery” examination. 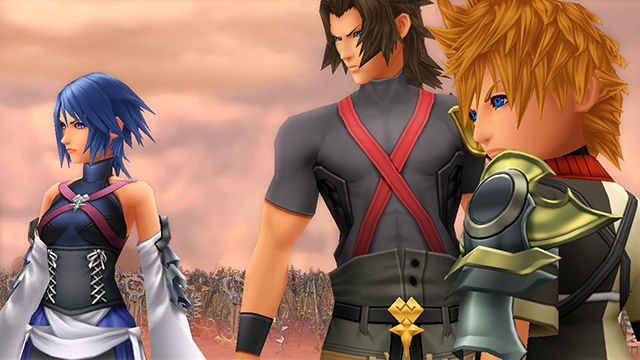 While Aqua passed the test, Terra did not, creating a rift between him and his friends. Shortly after came tidings of “Unversed” – strange creatures that thrived on negativity – and Master Xehanort has broken off all communication. Terra left to solve both mysteries; Ventus ran away to be with his friend. As for Aqua, Eraqus tasked her with keeping Terra under surveillance and bringing Ventus home as soon as possible. During Terra’s travels, Master Xehanort whittles away at the young man’s ethics, convincing him that darkness and light were equally important, and that a balance must be kept. Elsewhere, Ventus met Mickey, another trainee, and found himself crossing Keyblades with a mysterious masked boy named Vanitas. The three friends were reunited in Radiant Garden, but too much had changed. Terra felt betrayed by Eraqus and Aqua, and retreated deeper into Xehanort’s clutches; Ventus sided with Terra and ran off again; and Aqua was left to deal with a mixture of guilt, concern, and love. Guided by fate, perhaps, Terra arrived at the Destiny Islands and met Riku. He decided to bequeath the power of the Keyblade to this little boy who reminded him so much of himself. Some time after, Aqua visited these same islands and discovered what Terra had done. She, too, found a kindred spirit in Riku’s friends Sora, and told the boy to stick by his friend and guide him even through the darkest of times. Ventus returned to Master Eraqus in search of answers about his past. But the truth was a disaster waiting to happen, and Master Eraqus had no choice but to lock his pupil’s heart away to keep that disaster contained. Terra arrived just in the nick of time and battled his master to protect his friend. But this was exactly what Master Xehanort has hoped for; Terra watched in horror as his new “mentor” struck down the weakened Eraqus. He has been fooled. Terra tried to move Ventus someplace safe – the Destiny Islands. But Vanitas, the boy with the mask, was already there. “Join with me; become the χ–blade,” he said. And then Ventus remembered the truth: Vanitas was a part of him – the darkness which had been extracted from his heart. 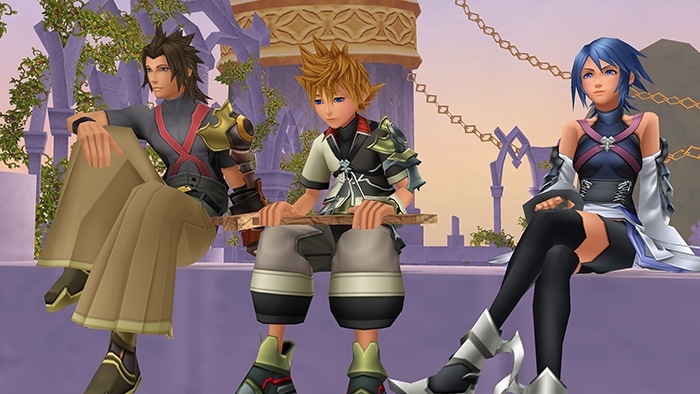 Lead by destiny, Terra, Ventus, and Aqua assembled in the Keyblade Graveyard. In the distance, Master Xehanort and Vanitas appeared. A violent clash ensured, and at the end of it, Terra’s body was possessed by Xehanort. Meanwhile Ventus, having been forced into a clash with his counterpart Vanitas, chose the destruction of them both to prevent the χ–blade from being forged. In the aftermath, Mickey was able to rescue Aqua and Ventus, but Ventus would not wake, and Terra was nowhere to be found. Aqua’s journey was not over. Ventus’s heart had been nearly snuffed out, so he retreated to the safety of Sora’s heart – the same “new heart” that had saved him once before. Aqua found and confronted Xehanort, who has possessed Terra’s body. After a long fight, Aqua dove into the darkness and sacrificed herself to usher Terra back to the realm of light. Aqua wanted the realm of darkness for a decade before meeting a stranger there. This stranger told her about a certain boy who had become the savior of all worlds. When Aqua heard the boy’s name, tears filled her eyes, and her face beamed with hope. To help better understand the message King Mickey created a “datascape” from the worlds within the journal. But the datascape was riddled with bugs, and the king had to rely on the digital version of Sora to debug the journal from the inside. While exploring the Destiny Islands datascape, a figure in a black coat explained that uncovering the “Keyholes” was the only way to mend the worlds. Sora found the Keyhole in Traverse Town, and used it to reach the next world. As he did, a new message appeared in the journal back at Disney Castle… and the king was alarmed to discover the castle had been invaded by Heartless! Worse yet, he and the other were now trapped in the library. Again, Sora came face–to–face with the figure in the black coat. And this time, when he followed the stranger, he found himself in the same room as King Mickey and the others. How had they wound up in the same place? The figure in the black coat turned out to be a digital version of Riku, who explained what was going on. He had been chosen by the journal as a backup storage to protect its data. Now Riku and the journal were one and the same, and he had brought Mickey and the others into the datascape to help solve the mysterious message. Just then, someone took over the pathway between the datascape and the real world. There was no way out! Sora set off to repair more worlds and secure a way home for his friends. It turned out Maleficent and her henchman Peter were the culprits. They were plotting to release the darkness inside the datascape into the real world. Sora tried to stop her, but she destroyed his Keyblade and kidnapped Riku. The King went after Riku, and Sora went after the king. 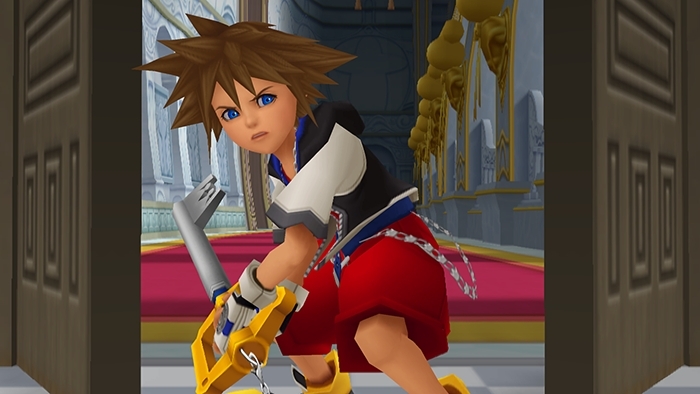 Sora’s friendship with Donald and Goofy gave him the power to recreate the Keyblade. Pete had infected Riku with bugs and tried to put the two friends against each other, but after a short fight, the infected Riku collapsed. 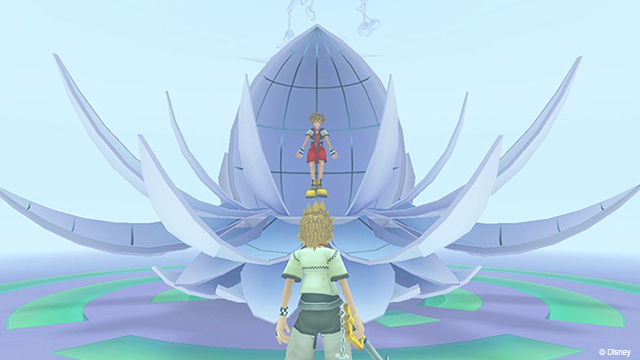 Sora dove into Riku’s datascape to save his friend, and defeated Maleficent inside. However, it wasn’t until he took out his own Heartless – the original bug which was threatening to delete the whole datascape – that the journal was finally restored. But because restoring the journal was tantamount to overwriting all record of this newest journey, Data Sora and King Mickey had to say good-bye. However, the mysterious messages was still a mystery. 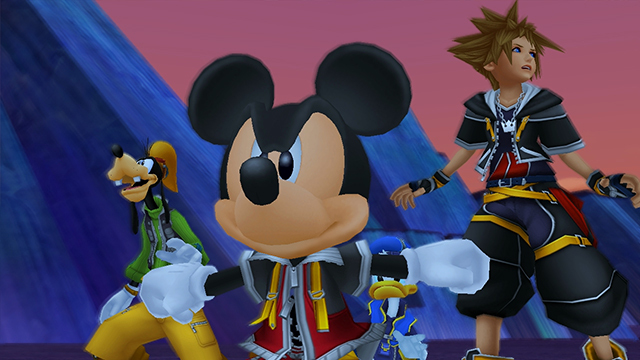 Back in the realm world, King Mickey and the others received a message from Data Riku that “extra data” had been found. They would need Data Sora’s help one last time. The extra data was a special world designed to make Sora learn how to cope with hurt. When Data Sora was finally able to accept that hurt, Naminé appeared before him. She explained that inside him were special memories that belonged to people connected to the real Sora – people who were hurting. The mysterious message was her way of reaching out to him and preparing him for that truth. King Mickey promised Naminé that they would undo all the hurt. Back in the real world, he wrote a letter to the real Sora and explained there were others out there that only Sora could save.